In case you need a car hire in Haskovo, you surely have to look for Val and Kar Rent a car. The company works throughout Bulgaria and the neighboring countries, at all airports and the bigger cities. It has been serving customers in Haskovo region for many years. Val and Kar Rent a Car makes deliveries to any customer-selected location. The company has years of experience, works with new rental cars from all sizes and categories, from small city cars to Station Wagon, SUV, seven- seats vans and nine-seats minibuses. And our clients in Haskovo and the region can rely on delivery of the rented cars at a given address. You have to make a reservation in advance, this can be done through our website www.val-kar.com, by e-mail at val_kar@abv.bg, or you can contact us on our phone numbers 029586565 070019002 0878400123. Our business hours are from 9:00 to 18:00 except on Sundays and national holidays. Please note that you can land at Sofia Airport after a reservation made in advance and we will meet you directly there. This would save you the search for ways to reach Haskovo or another location. And your choice of car rental will be even bigger. You will get the best clarity if you visit our car rental website. Fill in date, location and time of rental and return then you will be able to choose a class of car from the available offers. If you are traveling outside of Bulgaria or you need additional equipment, you must request this in advance. We recommend that you familiarize yourself with the additional terms and conditions. Do not forget to order additional insurances, which are for damage and theft and are not included in the daily rental price. It is important to choose a car that is suitable for your trip. Please conform the number of passengers and the amount of luggage to the size of the car. When you browse our rental cars, apart from the basic features, there you will find information about the number of passengers and the amount of luggage each one can collect. Also, choose whether to rent a car with manual or automatic gearbox. In case you have more passengers or more luggage, we can offer you a van or minibus rental. The good news is that with the cars of Val & Kar you can travel anywhere with no limitations. But if you decide to visit countries different than Bulgaria, you have to tell us which these countries are in order to prepare the necessary documents for you. If you need assistance in choosing a rental car, Val and Kar Rent a Car team can always guide you and give you the necessary information. Once we have specified all the details of your booking, you can choose how you prefer pay the rental price and how you prefer to leave the deposit or liability. Payment can be with credit/debit card, via bank transfer or in cash. The deposit/liability can be left in cash or by credit card. The employee who is in charge of the delivery will show you the car and its specifics, he will answer your questions and assist you with everything you need. Virgin Mary monument. The city has a thousand-year history, reflected in the collection of the Regional History Museum. His expositions are also located in the Paskaleva House, Kirkovo School and the Museum of theThracian Art. It is situated near the village of Alexandrovo as part of a complex including the museum exposition and the Thracian tomb of Alexandrov. 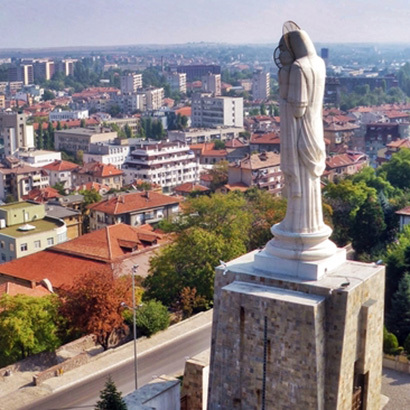 You have to enjoy the Haskovo Mineral Baths with the Ikar Monument, Kenana Forest, the Sun clock, the bell tower, the old clock tower, the monument of Captain Petko Voyvoda and the famous monument of envy in Haskovo. You will be interested to visit the church of St. Archangels Michael and Gabriel, the Brotherhood mound, Chorbadji Dimitrak House, the Ivan Dimov Drama-Puppet Theater, the regional library "Hristo Smirnenski", the monument of the unknown warrior, the Art Gallery, the Charshi Mosque , Eski Mosque, Armenian Church "Surp Stepanos", Chapel "St. Petka Bulgarska" and others. In close proximity to Haskovo you can visit an observatory and a planetarium in Dimitrovgrad, Assen's fortress near the village of Klokotnitsa, Uzunjov church in the village of Uzundzhovo, Dobrich Monastery "Uspenie Bogorodichno" - located south of the village of Dobrich, Ancient Thracian nymphs sanctuary near Kasnakovo, early Christian church - Krepost village, Thracian dam on Harmanliiska river, fortress St. Spirit (also known as Toplitsa), Thracian cult complex Garvanitza near the village of Gorno Bryastovo, mineral complex Slanchevtsi. We are sure you will not want your journey to end with Val and Kar car rentals. We will be grateful to you for all your recommendations regarding our service and fleet. And when you do not endure the temptation to rent a car from us again, notify us that you have already been our customers. In this way we can easily advise you for a suitable car rental in Haskovo and our regular customers receive special discounts.